Yesterday, I walked the whiteshirtwalk with so many of you. It was touching to see how our community rapidly came together to support our friends affected by the DBMC announcement. People are asking how they can help. So I approached the marina group for permission and have volunteered to raise funds they can utilise in their fight to save this piece of our community. Discovery Bay Marina Club has been a long time part of the greater Discovery Bay community. Many of us have good friends, with families, that spend most of the time in the marina. As you maybe aware, there was a sudden notice of the termination of debentures, club membership and therefore eviction of the Discovery Bay Marina club boat owners, and their families. This has caused complete devastation within our close knit community of Discovery Bay, and Hong Kong. For those not directly impacted, our feelings of disgust at the situation cannot even compare to the shock and life changing devastation that the boat owners and families themselves are experiencing. The communities’ thoughts and words of support have been overwhelming, but now many of us outside this immediate crisis would like to help further. 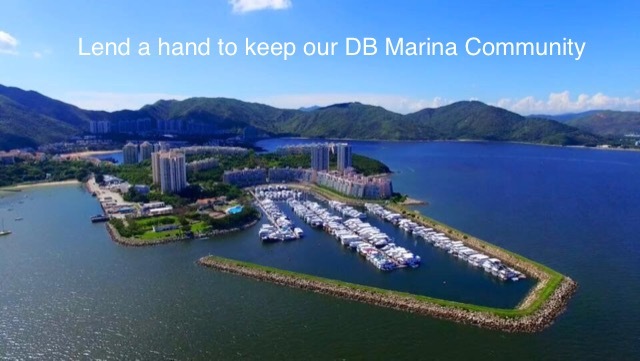 Many have said they want to help them fund the campaign to have HK Resorts International and the Discovery Bay Marina Club reconsider their action. Let's stand together as a unified front and support them in their campaign to stand up for their and our rights within Discovery Bay. We have been in contact with the Marina club families and with their permission, we are launching this simplygiving account for supporting them in this struggle. If you feel you cannot support them in any other way then this is your chance to do something tangible to help. Today it’s the place they stay, their life savings and we want to help them avoid the financial ruin that many are facing. It may be the Marina this month but who knows what other plans are being hatched to change our community beyond recognition. It is our moment to take a stand and support our friends. Welcome to the new Hong Kong where companies are now lying and cheating to please their Mainland investors. Ethics and social conscience? That was the past. Now only profits and the owner's ego count. We must not let them get away with this. This is still Hong Kong, not Mainland China. We are Behind your Efforts 100%, We are also Sadly affected by this event. HKRI has been quoted "Our Discovery Bay community is an outstanding example of successful collaboration between HKRI and residents where we jointly promote the well-being of the residents..." How does the eviction of 200 families demonstrate collaboration & promote the well being of DB residents? HKRI fails to understand that the spirit, strength and success of the discovery bay community does not come from HKRI! It comes from the folks who live here. HKRI's behaviour in this matter has been unconscionable. HKRI should be held accountable for their greed and the anguish they have caused the families they intend to evict. HKRI boasts, “it is guided by 'PRIIDE' , values - Pioneer, Respect, Innovation, Integrity, Devotion, Excellence”. I ask the directors if these are cliched, empty words of propaganda to fill a brochure, or do you really aspire to these values, and if so this is an opportunity to prove it! Over the last several years, HKRI have demonstrated they are more interested in promoting tourism to DB than promoting the community and advancing the quality of life for residents. Examples include the bus loads of people regularly brought in for public holiday activities vs the refusal to provide public use sports pitches for residents. Once again, potential new visitors to an undisclosed marina facility sometime in the future are given priority over existing residents who have committed their family’s financial well-being to a special lifestyle. HKRI continues to erode the trust of its customers and communities. No one should feel confident that HKRI will do the right thing vs what is commercially expedient for them. I am a 12-year Discovery Bay resident; I am married with two teenagers, who were adopted from Russia and India and both have grown up here in Discovery Bay. We have one cute doggie and we volunteer at HK PAWS. I am a Finance Director and have worked at an asset management company for the past 25 years.